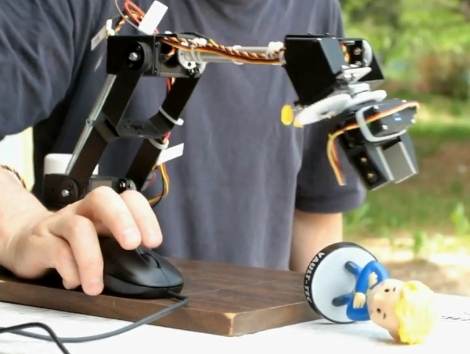 [Oleg] worked out a way to use his USB mouse to control this manipulator arm. Using a Lynxmotion AL5D (we’ve seen the AL5A previously) he drives the six servos with an Arduino servo shield. A USB host shield handles the HID end for connecting the mouse. The video after the break says it all, [Oleg] has no problem picking up that figurine quickly and accurately. Sliding the mouse controls horizontal movement in all directions. The scroll wheel moves the claw up and down. And holding the left or right buttons what using the control wheel closes or rotates the claw. All we can say is: Bigger, BIGGER! 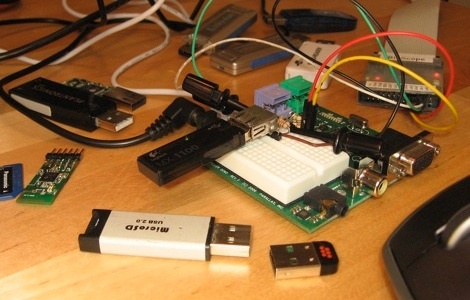 [Micah Dowty] has implemented full speed USB host control on a Propeller microcontroller. He’s motivated by the thought of using USB based WiFi and Bluetooth dongles in his projects as ready-made solutions.We’ve seen USB host control with the Arduino and it really opens up the flood gates for advancing your projects through storage, wireless connectivity, and user interface. So far his work is fairly preliminary but the results seen from other participants in the Parallax forums are very positive. Check out his code from the subversion repository and lend a hand with the development.